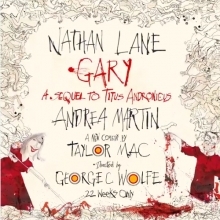 In Gary, Taylor Mac's singular world view intersects with Shakespeare's first tragedy, Titus Andronicus. Set during the fall of the Roman Empire, the years of bloody battles are over. The civil war has ended. The country has been stolen by madmen, and there are casualties everywhere. And two very lowly servants are charged with cleaning up the bodies. It's only 400 B.C. - but it feels like the end of the world.